When we started the school year, we received the AMAZING news that our school would be a pilot school for iPads!! Not only were teachers getting iPads, but so were the students. Upper grades got iPads for each student and lower grades got one for every two students. Awesome!!! I have to admit that I was excited, yet a little nervous about implementing all of the great ideas because I was only there a few months before I left on maternity leave. I wasn't sure how I was going to teach the kids all of the things I wanted to on the iPads (added to our normal curriculum) before I left, but guess what??? Most of the kids could teach me things by the time I returned!!! Anyone use iPads in the classroom? One of the first things we tried were QR codes, fun and easy!! 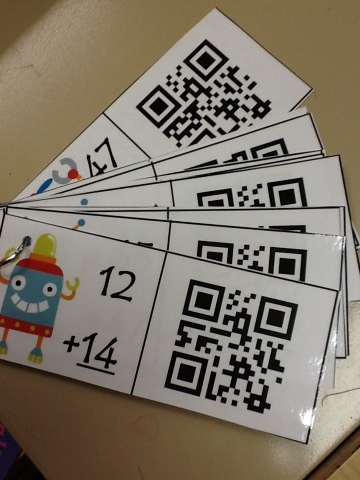 These QR codes get the kids up and moving around the classroom, completing tasks that they may normally do in their seats. Students complete the task, then use the iPad to check their answer by scanning the QR code. I wish I had more pictures of my students actually using the QR codes. They love it!! Did you know you can create QR codes for anything? Simple answers like below, websites, videos, pictures, etc. The best news is that is summer I have been invited to attend an iPad teaching conference in Chicago! I can't wait for all that the conference will have to offer!! I have a feeling that ill be overwhelmed and not even know where to start when I get back. But you know what? I love that feeling!! It gets me so pumped for teaching!!! I need to add that excitement back to my career again.